Words cannot describe this experience, there is no doubt that this 'tour' is worth your time. Dewa is beyond authentic, with a smile and a calm voice, he opened the doors not only to his house and village, but to a philosophy of life that holds more truth than anything we own or desire, one that allows us to exist beyond ourselves in close connectedness to nature and the seasons, community and cycles of life. The food we cooked under the family's guidance was delicious, varied and plenty, and I do not exaggerate to say that some of Dewa's words have had an irreversible, amazingly positive impact on my life. Yet, even if adding spiritual light onto your path while in Ubud is that's not what interests you, the time walking around the 'garden', and the discovery of the different wholesome ingredients that are included in these traditional recipes is just a time of simplicity, fun and joy. Also note that this is not one of the tours where there's many other people with you, it's a private tour and has a very different feel not that the other are not usually good, but this was the best cooking tour i've personally done- you also get to keep the recipes. A rich sharing experience that is worth every cent and more. Dewa, thank you so much for your light, Adrien and I shall carry it always. Until we meet again Sensei, I wish you and your family good health and happiness- Astrid. 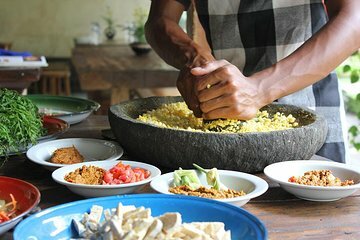 We were in Bali for 10 days on our honeymoon and were excited to do a cooking class initially looking at some small group classes when we stumbled on this experience. Our time with the host, Dewa was truly a blessing and amazing experience!!! First, this is an incredibly authentic experience.... Dewa met us at a hotel close to his home we were in the vicinity and suggested coming to him and took us first on a walking tour of the local gardens, rice fields allotted to his home and neighbors and also local forest area. He explained so much about the agriculture, the history of Bali, the indigenous and also alien species of plants, herbs etc. We learnt why Balinese families have dogs, and also ducks and so much about the history of the people, the volcanic lands etc. Then back at his traditional compound, we were invited in and had a wonderful experience hands on preparing a multi-course meal, learning about the medicinal uses of all of the spices and ingredients drinking lemon grass tea over a series of days is a natural mosquito repellent!. We had extra food from our class and Dewa asked if we would like to bring our guide and driver who were waiting for us to the meal and they were blown away with the food we made. The is part cooking class, part cultural experience, and part insight into the wonderful mindset of the Balinese people.....thoroughly recommend!! This was definitely an experience, a gift. Thank you Dewa. We love to cook with the best of ingredients and this wonderful opportunity broadened our understanding of so much more. The support given to the local village by Travelling Spoon inc is also a revelation giving a chance for tourists to get up close and involved in village life. Dewa was the prefect host, we learned a lot about Buddhist philosophy and Balinese way of life. And of course the food we prepared was heavenly to us.A big plus seeing the plants growing in the garden and having the recipes to make a similar feast we we get back home. Many thanks Dewa. Best tour ever ! A must do with Dewa !